2012’s App Store Editor’s Choice is invading Rio! New missions, soldiers, weapons, and abilities await! Assemble a squad of fearless soldiers and lead them into explosive, turn-based battles against your friends and single player missions around the globe. Use the outrageous special abilities of your mighty mercs to turn the tide of battle and come up with hilarious new ways to leave your opponents eating your shrapnel/bullets/dust. Level up your squad as you play to master new abilities and use the spoils of war to unlock brand-new soldiers, weapons, and outfits. 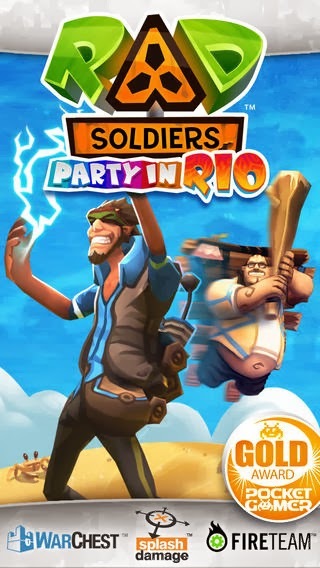 Created by the award-winning developers of BRINK™ and the Enemy Territory™ games, RAD Soldiers is a salvo of engaging tactical action created exclusively for iOS. - Regularly updated with new features and content! Post your feedback on forums.warchest.com and let us know what you want to see in future updates! WarChest and RAD Soldiers and their respective logos are trademarks or registered trademarks of Warchest Limited. All rights reserved. Brink is trademark of ZeniMax Media Inc. in the U.S. and/or other countries. Enemy Territory is a trademark of id Software in the U.S. and/or other countries. All other trade marks are the property of their respective owners. Warchest, RAD Soldiers and its developers are not associated with or endorsed by any of the foregoing. The existence of any event, third party brand, image, name, likeness, logo or trade mark is coincidental and implies no such association with or endorsement. • Introducing loot crates: Collect special loot crates for random rewards including weapons, skins, and Soldiers! LIMITED TIME ONLY. • Check the list of reachable tiles for enemy units when determining whether an AOE can hit them or not instead of doing a straight tile distance ignoring obstacles. Don’t forget to rate RAD Soldiers in the App Store if you want to see more updates in the future! Got feedback? Let us know on the RAD Soldiers forums (forums.warchest.com), Twitter (@warchestgames), and Facebook (/RADSoldiers).